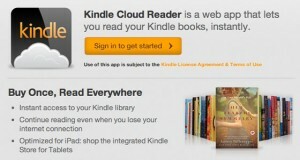 Amazon today launched Kindle Cloud Reader as a way to counter Apples restriction. After reinforcing rules in its App Store, Apple saw to it that Amazon’s Kindle application would stop allowing customers to buy books from within the app. With the introduction of an HTML5-coded web app that does everything the iOS app did, plus allows customers to shop for books from its interface. You can access it at www.amazon.com/cloudreader via Safari or whatever web browser you use on your iPad. “We are excited to take this leap forward in our ‘Buy Once, Read Everywhere’ mission and help customers access their library instantly from anywhere,” said Dorothy Nicholls, Director, Amazon Kindle. “We have written the application from the ground up in HTML5, so that customers can also access their content offline directly from their browser. The flexibility of HTML5 allows us to build one application that automatically adapts to the platform you’re using – from Chrome to iOS. To make it easy and seamless to discover new books, we’ve added an integrated, touch optimized store directly into Cloud Reader, allowing customers one click access to a vast selection of books,” added Nicholls. Just like the app, the web-based Kindle lets you select any book to start reading, customize the page layout to your desired font size, text color, background color, and more. You can view all of the notes, highlights, and bookmarks that you’ve made on other Kindle-supported devices, and you can sync your last page read across all of them. Amazon cannot stress enough that “customers can start reading their Kindle books immediately using Kindle Cloud Reader at www.amazon.com/cloudreader,” to make it clear that you don’t need the Apple-rejected app right now.